As we adjourn for the Summer recess, we bid a fond farewell to Linda and her bear. We are planning a summer outing, destination yet to decided upon. After a speedy yet fullsome AGM, the club is judged to be in a healthy state as we contemplate the year ahead. 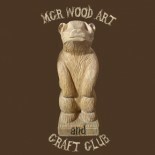 This entry was posted on July 26, 2013 by mcrwacc in wood carving and tagged adult learning, art and craft, club, craft club, manchester, night class, pyrography, wood carving, wood turning.